The Global Volcanism Program has no activity reports for Hell's Half Acre. The Global Volcanism Program has no Weekly Reports available for Hell's Half Acre. The Global Volcanism Program has no Bulletin Reports available for Hell's Half Acre. Hell's Half Acre lava field, the easternmost of the young basaltic lava fields of the Snake River Plain, covers an area of about 400 km2 SW of Idaho Falls. Basaltic lavas forming the broad, low shield volcano are dominantly pahoehoe flows that were erupted from a 3-km-long, NW-SE trending vent system at the NW part of the field during a brief eruptive episode about 5200 years ago. The summit vent area contains an irregular, elongate 0.8 x 0.3 km central depression that was the site of a former lava lake that fed late-stage flows. About 10 circular pit craters truncate the surface of the lava lake, and two prominent lava tube systems are located near the summit vent complex. Two major lava flow lobes, each about 5 km wide and 10 km long, extend to the south and SW along the flood plain of the Snake River and surround Morgans Pasture, a large kipuka. Interstate 15 highway crosses the SE margin of the lava field SW of the city of Idaho Falls. Karlo J F, Clemency C V, 1980. Picrite xenoliths from the eastern Snake River Plain, Idaho. Contr Mineral Petr, 73: 173-178. Kuntz M A, Spiker E C, Rubin M, Champion D E, Lefebvre R H, 1986. Radiocarbon studies of latest Pleistocene and Holocene lava flows of the Snake River Plain, Idaho: data, lessons, interpretations. Quat Res, 25: 163-176. There is no Deformation History data available for Hell's Half Acre. There is no Emissions History data available for Hell's Half Acre. A broad frozen lava lake rises almost to the rim of the 800 x 300 m wide summit crater of Hell's Half Acre shield volcano, the easternmost of the young basaltic lava fields of the Snake River Plain. The 300 x 800 m wide lava lake is seen from the summit of the low shield volcano, with East Butte and Middle Butte visible to the west on the upper right horizon. 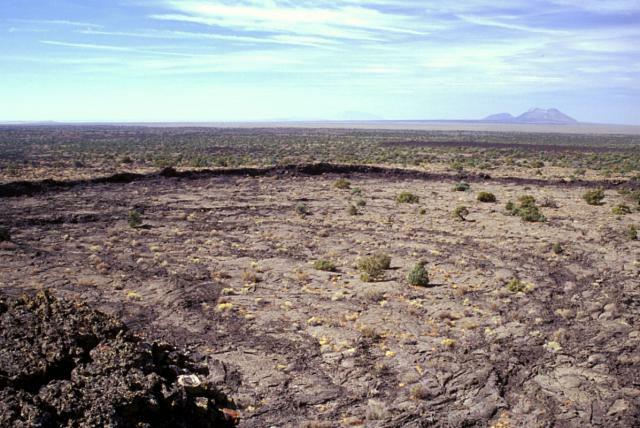 Dominantly pahoehoe lava flows were erupted from a 3-km-long, NW-SE trending vent system in the NW part of Hells Half Acre lava field about 5200 years ago. There are no samples for Hell's Half Acre in the Smithsonian's NMNH Department of Mineral Sciences Rock and Ore collection. Large Eruptions of Hell's Half Acre Information about large Quaternary eruptions (VEI >= 4) is cataloged in the Large Magnitude Explosive Volcanic Eruptions (LaMEVE) database of the Volcano Global Risk Identification and Analysis Project (VOGRIPA).